You will need a jailbroken iOS device in order to work this feature. Once done, LyricForMusic will bring lyrics into Music app. 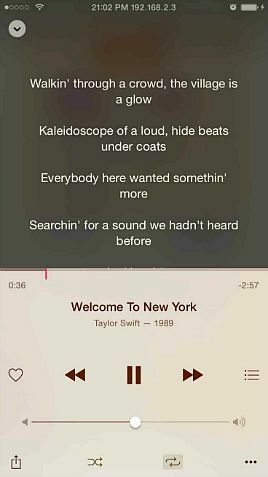 All you need to do is just simply touch the album cover when listening to a song; it will replace with the lyrics for whatever song you playing without any configuration. It doesn’t require additional setting such as enabling or disabling it, you can utilize it after installing it. The best thing is, it is not only compatible with Apple Music, but also supports whatever song purchased in iTunes Store and songs imported from iTunes. Since, all of the lyrics are pulled from the Internet, which means it requires a working internet connection in order to pull the lyrics and display them. 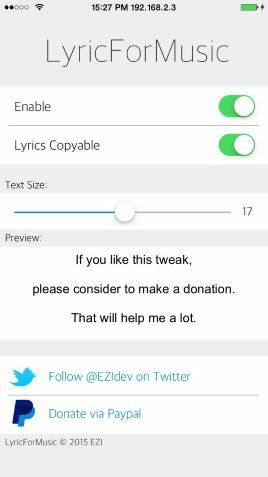 LyricForMusic is available for free and you may download from Cydia’s BigBoss repo.